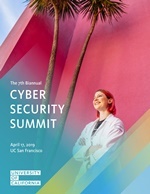 UC will hold its seventh biannual Cyber Security Summit on April 17, 2019 at the UC San Francisco Mission Bay campus (UCSF MB Conference Center, Fisher Ballroom, 1675 Owens Street). The April summit speakers will present on cybersecurity topics to include risk reduction measures, cybersecurity law, election security, cybersecurity within emerging technology, and human rights. Registration is open until March 28, 2019 and space is limited to 170 attendees. There are two major airports near San Fransisco: San Francisco International Airport (SFO) and Oakland International Airport (OAK). Below you will find the approximate travel time to UC San Fransciso Mission Bay. Please allow time for travel as traffic can significantly increase travel times. Once you arrive on campus, parking permits cost $32/day. Self-pay and PayByPhone options exist, no coins or cash are accepted. Uber, Lyft, or other ride share is recommended. Hotel Emblem, 562 Sutter Street, San Francisco (415) 433-4434. Registration link: Hotel Emblem Discount Rate. To book by phone, call (415) 433-4434. Group name “UC Cybersecurity Summit”. Cut-off for reservations is March 26, 2019. Hotel waived Guest Amenity Fee.Parking cost is $58 per night. Hotel Spero, 402 Taylor St. San Francisco (415) 885-2500. Registration link: Hotel Spero Discount Rate. To book by phone, call (415) 885-2500, toll-free at (866) 934-5978. Group name “UC Cybersecurity Summit”. Cut-off for reservations is March 18, 2019. The Amenity Fee is $15.00 per room. Parking cost is $58 per night.